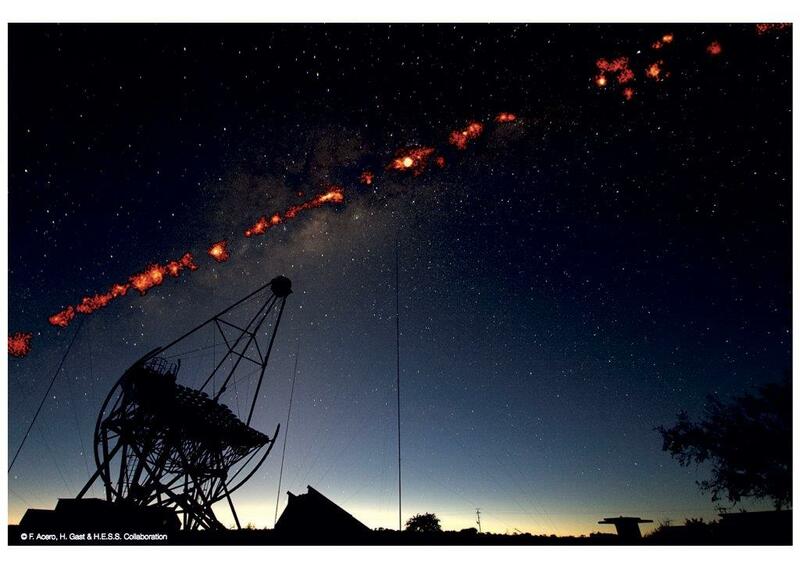 Very high energy gamma ray sources in the Milky Way, seen above the HESS telescopes in Namibia. It was in order to detect these extremely short flashes, and hence gamma-ray emissions, that fourteen countries set up the HESS array1, the world's largest gamma-ray observatory, in Namibia in 2002. The large mirrors of its five telescopes collect Cherenkov radiation and reflect it onto extremely sensitive cameras. Each image provides the direction of arrival of a gamma-ray photon, while the amount of light collected provides information about its energy. By building up images photon by photon, HESS can thus map astronomical objects in gamma rays. The HESS collaboration has already been awarded the European Commission's Descartes Prize in 2006, and the Rossi Prize of the American Astronomical Society (AAS) in 2010. A survey published in 2009 included HESS among the world's ten most influential astronomical observatories2. The entire gamma-ray astronomy community is currently preparing HESS's successor, the Cherenkov Telescope Array (CTA), a planned observatory that will be even more sensitive and based at two sites, one in the northern hemisphere and the other in the southern hemisphere. However, until the CTA becomes operational in the 2020s, HESS's findings published today will be used for the CTA's observation strategy, and will remain the reference in gamma-ray astronomy. "H.E.S.S. phase-I observations of the plane of the Milky Way" (Astronomy & Astrophysics Vol 612, April 2018).